Welcome to Lindsay Rae Harold Wagner's site! 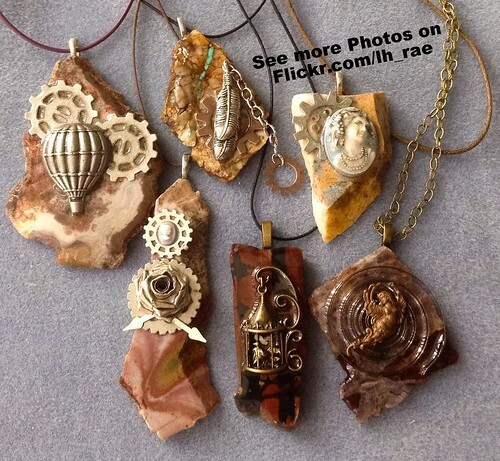 My art is a mixture of vintage, reclaimed, metalwork, fibers, and upcycleness all rolled into one. I started out majoring in photography before finding myself in applied design at San Diego State. Although growing up as a 3rd generation jeweler is really what started me on my current creative path. After college the need to create hit me and I started making jewelry to stay sane. Then came my signature crochet snoody hat which soon needed embellishments. Latter got involved with the Escondido Renaissance Fair and started pirate and mermaid inspired hair ribbons. Or maybe I had always had Stempunk, just without a name. One of my fist loves was dissecting old watches on a bench next to my Dad at his shop. The fun of reusing vintage and working with many new techniques led me to hat pins, hair sticks, and eventually to a strange collection of creatures I call Bugs. Today you can find my work at conventions, vintage shows and local art shows. Please follow the Flickr link above to see my latest creations.